Your phone buzzes. It’s a message from a friend asking to reschedule your dinner in an hour for another day. You’ve already put on something nice, so it’s a little inconvenient – but it’s also going to be tedious to make the adjustment on your calendar. Timepage’s recent update can’t change you back into comfortable clothes, but it can make rescheduling events much easier. As with most iOS 11 app updates, this comes through drag and drop and thankfully works on both iPhone and iPad. When you have an event in the Today section – that’s the one you’ll see when you tap on a specific day – you can tap, hold, and drag it to another day. On the iPhone, that means navigating back to the weekly view; on the iPad, however, it’s as seamless as dragging back over to the other side of the screen. For events that remain the same time, drag and drop works really well and is much faster than diving into the event and changing things around. When dates and times change, though, it almost makes more sense to change those details all in one swoop. 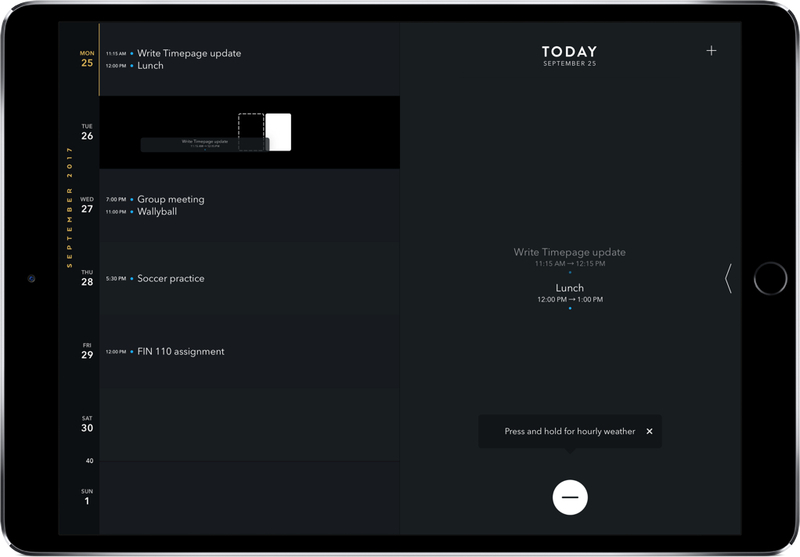 If the Timepage team can devise a way to adjust the time and date with drag and drop, it’ll make a big difference. Also for iPad is text drag and drop, enabling you to create events from lines of text like “Dinner at Texas Roadhouse” or “Let’s walk the dog tonight!”. To do this, select your text in another app, open Timepage, and drop it on the right day. You can then edit the time, location, people, and more. To check out the update or to purchase Timepage for the first time, you can find it for iPad ($6.99) and iPhone ($4.99).